How often did you pass on the veggies on your plate as a kid? Or how many times did Mom tell you to finish your veggies or tell you dessert was a no-no as a result? Well it looks like eating those veggies wasn't just a ploy on Mom's behalf. Sure, we know about the antioxidant powers of certain fruits and vegetables, and how they're a lot better to put on our plates than processed foods we'll crave in a weak moment in front of the vending machine. But it looks like Mom is right once again, and all of the coaxing and prodding at the dinner table to clear your plate of veggies wasn't for naught. 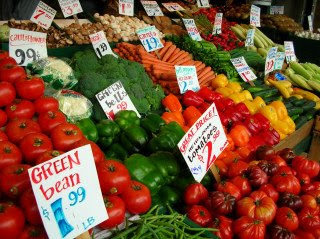 Take the colorful produce aisle at the store, chock full of carrots, bell peppers, tomatoes, asparagus, broccoli and beans. Those vegetables are screaming to get into your blood stream, not just to make the blood vessels flexible thanks to the antioxidants, but to help ward off cardiovascular disease. I read a Twitter feed by Women's Health that caught my eye--that a daily one-serving increase in veggies can decrease your risk of heart disease by 4 percent. And for heart disease being a top silent killer among women, my eyes lit up. Yes, it's hard to cram some of those fibrous foods into your system, but if there's a health benefit involved, why not trade the chips and ice cream (my downfalls) for some carrots and cucumbers, or beans and lentils, which are known to decrease heart disease? Need some help selecting from the produce aisle? Try these three vegetables that are rich in antioxidants and can help set your ticker on the right track. Broccoli. Full of flavonoids, a power-packed antioxidant, this shrub is rich in calcium, potassium, vitamin A, vitamin C, vitamin E, manganese, selenium and copper. Plus it's full of nonsoluble fiber that will help clean out the intestines and absorb nutrients. Kale. Rich in more flavonoids and nonsoluble fiber, you'll also find calcium, vitamin A and vitamin C as stand-out nutrients. Carrots. With a one-two antioxidant punch--carotenes and flavonoids--carrots also pack in nutrients like vitamin C, vitamin B, vitamin E, manganese, selenium and copper.